The view of the city of Natal from the top of a sand dune in Jeni Pabu. During our first full weekend in Brazil James and I, along with several of James’ coworkers, took a road trip to the nearby town of Natal. 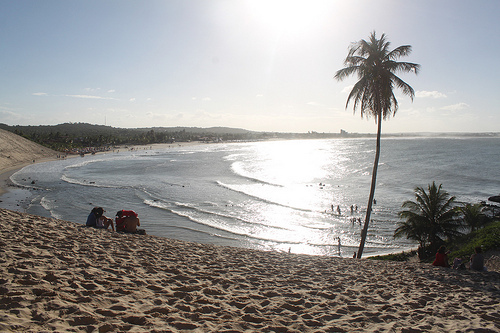 Just four hours North of Recife, this popular beach town was founded on December 25, 1599 and therefore appropriately named Natal, which means Nativity or Christmas in Portuguese. Rain threatened our first morning but quickly passed leaving us to laze happily on the beach. 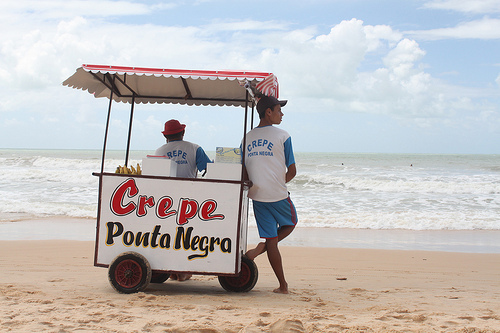 Selling Crepe’s on Ponta Negra Beach in Natal, Brazil. As the hours passed I quickly discovered why Natal is a popular destination. With local shops and restaurants dotting one side of a small yet busy street and miles of sandy beach on the other it is the definition of a great beach town. 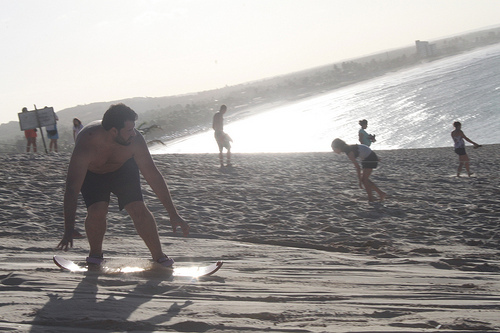 There isn’t anything you can’t find on the main beach of Ponta Negra. With vendors selling food, drinks, CD’s and an array of souvenirs you’d be hard-pressed to leave but a nearby area called Jeni Pabu lured us in with promises of giant sand dunes. After several wrong turns and the threat of being swept down a small, flooded road we arrived to Jeni Pabu with high hopes and hungry bellies. 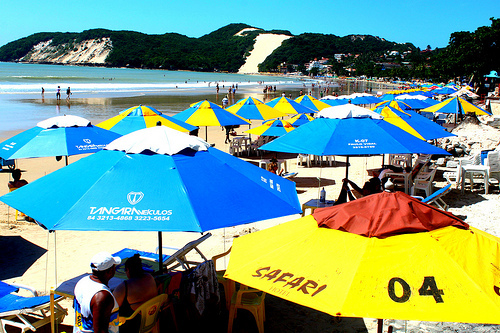 Jeni Pabu Beach in Natal, Brazil. After a lunch of fried shrimp, fish, rice and beans we were ready to tackle the mountain of sand before us. When you stare up at a huge wall of sand the task of climbing up it seems daunting and for me it was. I ended us taking a much easier route while James and his friends ran up like a couple of schoolboys. Nothing prepares you for what you find once you’re atop the dunes. 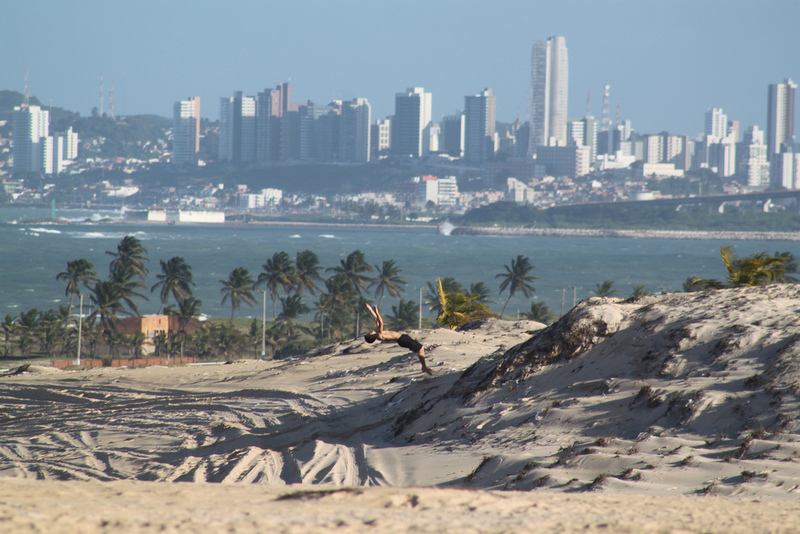 There are miles of sand with Natal’s skyline as the backdrop. 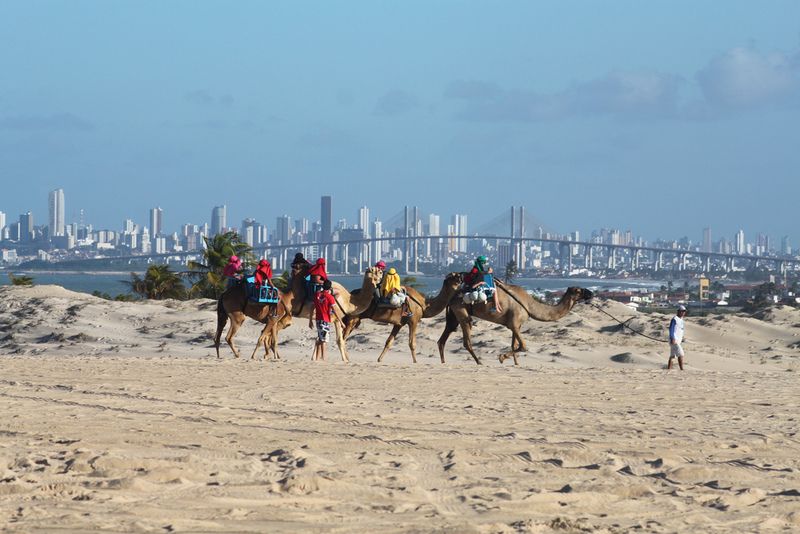 If one didn’t know any better you’d think you were in the Arabian desert not a Brazilian beach. This is especially true when you spot the Camels that will take you for a ride across the top of the dune. While I did not partake in the Camel rides (I feel weird using animals for sport when you don’t have background on how they are treated or their living conditions) I did have a blast “sand surfing”. This is where you ride a board down the slope of the dune either sitting down or standing up. The boards are waxed on the bottom for maximum speed and if you’re lucky you’ll reach the bottom without wiping out and getting a mouth full of sand. I swore I’d try it once but before I knew it I had zoomed down several times, never quite making it to the bottom. Forget the waves and surf on the sand in Jeni Pabu. On our last day in Natal we decided to check out a nearby fort that we had passed several times over the weekend. While I couldn’t fully appreciate the history during the visit (everything was written in Portuguese) the view of the ocean as you lay on the wall of the fort was breathtaking. I could have easily stretched out and listened to the waves crash against the ancient building for hours. Inside Forte de Feis Magos in Natal, Brazil. As I researched the area later, I learned that the fort is named Forte de Feis Magos or Three Wise Men Fort and it stands at the mouth of the Potengi River. Construction began in January of 1598. 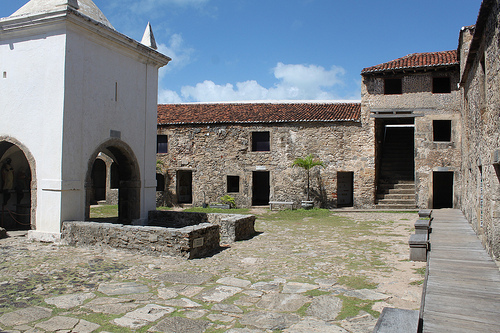 In 1633, the fort was taken by the Dutch who had invaded northeastern, Brazil and was later recovered by the Portuguese in 1654. Knowing the he history only added to the beauty of an already majestic visit. After a weekend of sun-bathing, people-watching, eating great food and lodging sand in every crevice of my body it was time to head back to Recife. My first road trip in Brazil was a success and I look forward to many more to come. To see all of my pictures from my trip to Natal check out my Flickr set here. Ponta Negra Beach in Natal, Brazil.